The Office of the Special Prosecutor has charged one of Bakkavor’s owners Lydur Gudmundsson and Bjarnfredur Olafsson, a lawyer at Logos and a previous member of the Kaupthing board. According to Ruv (the State Broadcaster) Gudmundsson is being charged in relation to a move in October 2008 when the ownership of Bakkavor was changed and at the same time an attempt by Kaupthing to recover loans from Exista, either by payment or by taking over Exista shares pledged to Kaupthing, was thwarted. An important part of this move was to secure the ownership of Lydur and his brother Agust over Bakkavoer, the profitable UK food company. What Gudmundsson planned and Olafsson helped him to execute was to organise a round-about of loans that seemed to be destined for Exista but did indeed not end up there. Gudmundsson, at the time Exista’s director of the board, made it look as if Exista was getting ISK50bn of fresh capital but in reality, on ISK1bn ended in Exista. The money came indeed from a company owned by Exista. What Olafsson did was to send a statement to the tax authorities and the Shareholders’ Directory, claiming that the liquidity had been increased by ISK50bn when that was, according to the OSP, not the case. Consumers in the UK may not know it but when they buy chilled ready-made food in a UK supermarket it’s pretty likely that the food they buy is produced by Bakkavor, the largest UK producer of chilled ready-made food. Bakkavor isn’t a household name in the UK but its goods are, sold under the brands of various supermarket chains in the UK – and Bakkavoer was owned by Gudmundsson and his brother Agust. These moves in autumn 2008 were made so as to make sure they would hold on to Bakkavoer. The Gudmundsson brothers have fought ferociously to keep their ownership of Bakkavor. When it seemed, after the collapse, that the brothers were losing their hold on Bakkavoer, the company’s foreign creditors insisted that the brothers would keep on running the company. That was very much against the will of some of the Icelandic creditors, partly because they felt the brothers had been a bit too clever safeguarding their own interests in Bakkavoer. Recently, one of the Icelandic pension funds sold its shares in Bakkavor in frustration over the brothers’ continued influence there and overt effort to gain control over Bakkavoer again. It’s interesting to notice that the events in question happened after the collapse of the banks. These events did at the time raise eyebrows, the media claimed that something had been wrong with this transaction and this action has continuously been questioned. The OSP charges will to many confirm a lingering suspicion connected to this action. This is the eight case brought by the OSP and the first that includes no banker but a major shareholder, in this case in Kaupthing. Exista was the bank’s largest shareholder. Robert Tchenguiz was on the board of Exista but he is in no way connected to this case. The charges are here, in Icelandic. *UPDATE: Gudmundsson and Olafsson are charged for breaking laws on shareholding companies. The maximum punishment is two years imprisonment. The OSP also demands that Olafsson will permanently be stripped of his licence to practice law. – The latest additions regard the brothers’ influence on Bakkavoer and their interests there. UPDATE March 13 2014: Today, Lýður Guðmundsson was sentenced at the Icelandic Supreme Court to eight months in prison five of which are suspended. Ólafsson was sentenced to six months prison, three of which are suspended. See ruling here, in Icelandic. Yet another example of the rotten heart of banking is being exposed at a court in London where the case of the USB trader Kweku Adoboli is ongoing. Adoboli is accused of “fraudulently gambling” away $2.3bn of UBS own money. Adoboli was a trader working on ‘proprietary trades,’ ie trading for the bank itself. From witness statements so far it’s clear that as early as 2008 Adoboli started hiding losses, starting with a loss of $400,000. The losses went up and down, as far down as ‘only’ $2m in July last year. Only briefly because by September 14 the figure had climbed up over $2bn. That day, Adoboli gave up and sent an email to his bosses, stating what he had done and what the situation was. Whether Sherrard’s interpretation is correct or not the witness statements show quite clearly that for some reason the limits imposed were continuously ignored. Adoboli was time and again far beyond the limits in his trades. Adoboli is now being sued and his colleagues lost their jobs for a behaviour the bank did nothing to stop. There is nothing to indicate that Adoboli’s colleagues and his superiors knew he hid his losses but they sure did know that he was trading way out of line with the bank’s own rules. This case makes it very clear that yes, there were rules as to how to carry out trades but no, these rules were not followed. The rules looked like something the bank could point at in case FSA inquired about them, in other words pure window dressing. There was more money to be made by not following the rules than by keeping them. Compliance to these rules wasn’t an issue at the bank. Traders like Adoboli weren’t supposed to follow the rules. So long they made money disobeying the rules was accepted, even condoned. On a day where Adoboli held a position of $200m – the limit was $100m – another supervisor, John DiBacco, complimented Adoboli. He made $6m on that position, and DiBacco wrote to him “well done” though later reminding Adoboli that he should tell him before and not after the trade. In these trades USB’s own money was at stake. If USB were a private company, gambling with its own money, this wouldn’t matter. The unfortunate thing is that the bank, indeed a private company, is a retail bank, ia putting at risk deposits covered by deposit guarantee schemes. Two measures would possibly help to counteract the rot: splitting apart retail banks and investment banks – and use the penal code more aggressively when there are justifiable grounds to do so. FSA’s chairman Lord Turner said in the summer of 2009 that the City was too big for the good of society. “”I think some of it is socially useless activity,” Turner said in a debate organised by the Prospect magazine. What an outcry from the banking industry these words caused. Now that we have a much clearer notion of this activity not only being socially non-useful and indeed directly harmful but in some cases against the law – keep in mind the LIBOR rigging, banks such as HSBC ignoring money-laundering rules – there is a good case for splitting permanently apart retail banking and investment banking. Two years ago a banker said to me that bankers wouldn’t understand anything but having retail and investment banking split apart. The momentum in that direction, on both sides of the Atlantic, is woefully anaemic. The Adoboli case is yet another exposure of the rotten culture in modern banking. Some soft reprimand won’t do away with the thinking demonstrated in the Adoboli case – that rules aren’t to be obeyed as long as more money can be made be disobeying them rather than obeying them. This culture applauds any way to make money in spite of all rules, making it all the more galling to think that a case after case is being closed by the authorities on both sides of the Atlantic where shareholders shoulder losses incurred by managers who think nothing of breaking the bank rules or indeed the law. The only way to change the culture is to make managers – and every single bank employee – realise that violating rules and laws will be dealt with in the same way as any offense. Anyone using a crowbar to rob a bank can be pretty sure that the police will spare no means to catch the offender. If a group of bankers, lawyers and accountants conspire to ia ignore laws on money laundering they can rely on the HSBC case and rest assured that the people they are working for, the shareholders, will be asked to pay eventual fines. What the Directive stipulates is that a EU/EEA state has to set up a DGS – and that’s what Iceland did: it did set up an insurance guarantee fund, TIF and thus fulfilled the Directive on exactly this point – but when needed the scheme was underfunded. Iceland then chose another way: domestic deposits were moved from the old banks in Iceland to the new banks – but no similar salvation was done in the Landsbanki Icesave branches abroad. Consequently, Iceland asked the Dutch to pay out the Dutch ‘Icesavers’ and indicated to the Brits if they could do the same. Which is why the Dutch and the Brits think that Iceland owes them money for this – both the Directive stipulated amount, up to €20.000 on every account – and the cost accrued by the Dutch and the Brits in funding this action. ESA’s lawyer Xavier Lewis said yesterday that it’s never happened before in the EU/EEA that deposit holders haven’t been paid. That’s the ESA view – that ‘Icesavers’ weren’t paid. That’s not entirely correct. The Dutch and the British ‘Icesavers’ were indeed paid – but not by the Icelandic TIF or by Iceland. Authorities in these countries did pay, which is why these two countries feel that Iceland still owes them both the sums stipulated by the Directive and the cost. The EFTA Court verdict will not end the Icesave dispute between Iceland and the Brits and the Dutch. ESA isn’t taking action on behalf of the Dutch and the Brits, and it’s certainly not asking the EFTA Court to rule on fair interest rates. The ESA is only asking the EFTA Court to rule on the alleged breach of the Directive – and discrimination. In court yesterday, Xavier Lewis referred to this Channel 4 reporting (a masterly piece by Faisal Islam) from February 2008 – on how safe deposits in Icelandic banks would be in case of failure – where David Oddsson then the Governor of the Central Bank of Iceland says the following: “These banks are so sound that nothing like that (ie banking failure) is likely to ever happen. And if something would happen you would never be talking about the whole amount of money because it’s never like that. But even so the Icelandic economy, the state being debtless this would not be too much for the state to swallow if it would like to swallow it (my emphasis).” – In the autumn of 2008 the state did indeed swallow a lot for deposit-holders in Iceland and promised to pay the Dutch and the Brits for compensating deposit-holders in these countries. As far as I can gauge, the discrimination part is the real danger and threat to Iceland. If Iceland is seen to have discriminated between domestic and foreign deposit-holders the ruling might oblige Iceland not only to pay the foreign deposit-holders, ie the ‘Icesavers,’ up to €20.000 on every deposit but to pay the deposits in full – because that’s what was done in Iceland. Then Iceland doesn’t need to pay out ISK650bn to the ‘Icesavers’ but ISK1150bn or ca 66% of Icelandic GDP (adjusted for growth and inflation) this year. Iceland is claiming force majeur – the Directive doesn’t cover such catastrophic events as the collapse of a whole banking system, claim the Icelanders. ESA refutes this, pointing out that the Directive does allow for “exceptional circumstances” (when deposit-holders can be paid out over a longer period). In addition, ESA points out that it can’t be the meaning of the Directive that the greater the shock the less the coverage for deposit-holders. The report for the hearing yesterday, going through the various aspects and opinions, can be found here. The verdict is expected in December and it can’t be appealed. – It couldn’t come at a more delicate time for the eurozone. In today’s Europe of heavily indebted eurozone countries struggling to convince the world that they can manage, think Italy and Spain, the breach of the DGS leads the thoughts to whether there actually is a state guarantee on deposits in the EU countries. Xavier Lewis and the EU lawyer, Enrico Traversa, seemed to indicate that this was the case – and yet not quite. The message was that whatever happened, depositors in the EU/EEA should rest assured that their deposits are guaranteed and safe. Safe, because the states guarantee that yes, deposit holders will be compensated, but it doesn’t mean that there is an outright automatic state guarantee. Now, the Directive doesn’t explicitly say there is a state guarantee – so the question is, if the deposits are and should be as safe as ESA and EU claim, why this isn’t said more loud and clearly in the Directive. The answer is, no doubt, that when the Directive was in the making, everyone could agree there should be a trustworthy system – but there was no agreement as to how it should be financed so the financing was left to the individual countries. The US DGSs were an inspiration, but they don’t imply an automatic state guarantee. (A state guarantee can be a moral hazard, tempting banks to be more reckless – an intriguing topic these days). The understanding was that the banks should finance the DGS – but some states treated their banking systems with kid gloves, didn’t want to burden them and well, in a good old tradition, raced to the bottom in order to enhance their competitive stance. How the countries go about financing their schemes still varies widely as can bee seen here in this report from 2010 by the European Commission to the EU Parliament on the Impact Assessment… on Deposit Guarantee Schemes. The discrimination part doesn’t touch anyone but Iceland – but the interpretation of the Directive is an explosive item right now. To my understanding, there is no automatic state guarantee implied in the Directive but that doesn’t mean states don’t have some obligations. They do, ia, have the obligations to regulate and supervise their banking systems in such a way as to hinder banking failure, thus hindering that a DGS needs to be used. Since both ESA and the EU have put some emphasis on Iceland’s shortcomings in this respect, what was said and done, the EFTA judges might focus on this, instead of referring to some sort of a state guarantee on the deposits. A breach of the Directive doesn’t necessarily incur any financial cost on Iceland. Countries are found to be in breach of some Directives all the time, do sometimes get fines but often they are just told to put their house in order. 1. Iceland argues that the relevant Directive 94/19/EC of the European Parliament and of the Council of 30 May 1994 on deposit-guarantee schemes requires states to put in place a deposit insurance scheme but it does not require, or even imply, a state responsibility for all claims that may be made against such a scheme. Iceland further argues that it established a deposit guarantee scheme and capitalised the scheme in accordance with EU norms (roughly 1% of the insured deposit base). 2. 85% of the Icelandic financial system collapsed and the Icelandic deposit insurance scheme was obviously unable to cover those losses. The same result, Iceland argues, would be true in any country that experienced such a massive collapse of its banking sector. 3. I hold that Iceland is correct in saying that an implicit sovereign guarantee cannot be read into the Directive. It would have been childishly easy for the authors of the Directive to require such a guarantee; they did not do so because the resulting liabilities on the balance sheets of member states would have been politically and financially intolerable. Reading a matter of such enormous import between the lines of a Directive violates every norm of statutory construction. 4. Iceland’s argument breaks down, however, on the question of whether the Icelandic deposit insurance scheme was adequately capitalised. An insufficiently capitalised scheme would fail to comply with the Directive. 5. Although Iceland is correct that its scheme was capitalised in accordance with EU norms, the depth of that capitalisation must be assessed against the background of the strength of the insured institutions. It is an inverse relationship. The stronger the financial position of the insured institutions (and thus the lower the likelihood of a bank failure and call upon the deposit insurance scheme), the less the scheme needs to be capitalised in order to be in compliance with the Directive. Conversely, the weaker the financial system, the higher the required level of the capitalisation of the scheme. 6. 85% of Iceland’s financial sector collapsed because that sector was woefully unsupervised and regulated. This much Iceland, in its own candid evaluation of the crisis, has admitted in its SIC report. 7. Iceland therefore had two honourable choices – it could either have reined in its banks and capitalised its deposit insurance scheme in accordance with the norms of other countries that similarly curb the congenitally high spirits of bankers, or it could have let its banking sector run wild but insured that when the bubble inevitably burst the deposit insurance scheme would be robustly capitalised to bear the loss. Instead, Iceland opted to abdicate its supervisory responsibilities while instituting a deposit insurance scheme capitalised at a level appropriate for a country that did engage in prudent supervision of its banking sector. 8. Accordingly, I hold there has been a breach of the Directive – not because the Directive implies a sovereign guarantee of all deposit guarantee schemes – but because Iceland’s scheme was appallingly undercapitalised in light of the bloated and unregulated nature of its financial sector. With this ruling, no delicate feathers in the eurozone are ruffled. As the readers can see, Chief Justice Nurgis has not ruled on the alleged breach of discrimination. The wise Chief Justice is obviously fully aware that this part of the case is a tricky one and needs further contemplation. This is the part that could possibly cost Iceland dear. A propos folk tales: there is an Icelandic version of the Faust story. Sæmundur the wise is the Icelandic Faust – but unlike the German, Sæmundur actually did beat the devil, inspiring Icelanders to fight against all odds. Remains to be seen if Sæmundur’s reckless luck will prevail at the EFTA Court. The news is out over the weekend that the Serious Fraud Office has withdrawn bail conditions regarding Robert Tchenguiz, Kaupthing’s largest borrower who at the collapse of the bank owed the bank over €2bn. The FT (subscription needed) quotes a lawyer who thinks this might mean that no further action will follow. However, it’s difficult to make sense of the SFO actions if, after losing judicial review to Robert and declaring a continued investigation against Robert, the SFO would now be retreating on that. My understanding is that bail is deemed to be of no practical use. That view is taken up in the Guardian coverage of this latest move in the SFO Tchenguiz saga. In Iceland the Office of the Special Prosecutor is prosecuting Kaupthing managers regarding the Qatari investment of 5.1% in Kaupthing in September 2008 (which has an interesting parallel in the Qatari investment in Barclays in 2008; another story for another day). It is also understood that the OSP could well sue Kaupthing managers for other actions. The main difference between what the SFO is doing and the OSP is that OSP has, so far, only charged bank managers, not the big borrowers. The summer hiatus on Icelog wasn’t really planned, summer just flew away but there is still this and that newsworthy. The Office of the Special Prosecutor is still mulling over alleged fraud cases. No doubt the successful sentencing of the Byr managers will make it easier to continue. Compared to what’s happening in other countries in terms of bringing bankers to court in cases where banks pay fine for breaching the law Iceland and the OSP are doing pretty well. But Icelanders are still feeling rather impatient, would like to see more happening now that it’s almost four years since the banks collapsed. The Icelandic economy is doing remarkably well, again compared to many other countries. The budget was presented today. Expected growth of GDP is 2.7%, inflation at 3.9% and unemployment will be down to 5.3%, from ca 8% this year. The current account deficit is expected to be 2.1% of GDP. – The weak side of the budget is the development in the eurozone. If the situation there deteriorate that could have adverse effect in Iceland. The outcome of this case, expected in ca two months, is a major factor of instability in Iceland in the coming year. A ruling against Iceland, especially on the discrimination issue, might burden Iceland with heavy financial liabilities. But Icelanders are always prone to believe in their luck – and perhaps signora Fortuna will side with them in this case though greater realist might be slightly more pessimistic as to the outcome in this case. The first real storm has just swept over Iceland, burying parts of the country in snow, killing sheep and disrupting traffic and electricity. The weather has died down now but it was a reminder that summer – which in Iceland was unusually good – is now definitely over. Then winter isn’t far away. Autumn is a notoriously short and fleeting season in Iceland, usually no more than a few days. The good summer meant that blueberries were everywhere and the lucky ones will have some in the freezer to see them through winter, not to forget the unbeatable jam made of Icelandic blueberries. 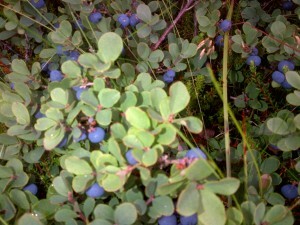 The blueberries on the photo below grew on Snæfellsnes – and they tasted as lovely as they look.